In short: A stylish, hi-tech luxury sports sedan. 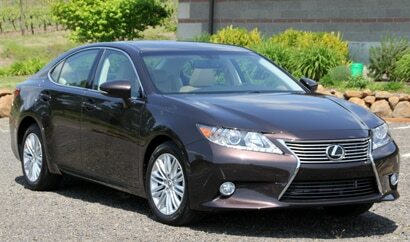 First introduced over 20 years ago, the Lexus ES 350 looks as current and innovative as ever for the 2013 model year. Now in its sixth generation, the stylish sedan boasts a host of fresh updates, including a striking, redesigned exterior, a retuned suspension and stiffer body for more precise handling and an intelligent transmission for enhanced driving performance and efficiency. The ES 350's 3.5-liter V6 with dual variable valve timing has been built with both fun and fuel economy in mind, offering 268 horsepower while still earning an impressive 31 mpg highway. Inside, cool options like an HDD navigation system with voice command and a rear backup camera help speed the sedan into the 21st century. Smart phone users will appreciate the Lexus Enform app suite, which provides seamless connectivity with Bing, OpenTable, Pandora and a plethora of other services through compatible mobile devices. While the Lexus ES 350 comes standard with a premium eight-speaker sound system with USB input, audiophiles may want to step up to the 15-speaker, 835-watt Mark Levinson system, which includes an eight-inch display screen, HD Radio with iTunes tagging, DVD audio/video and a Sirius XM Satellite Radio receiver.